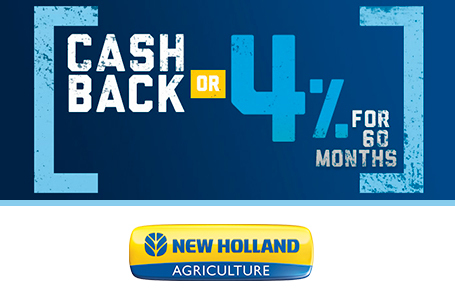 The Tradition of Value Continues: Whether you are a homeowner with acreage to maintain, an Ag-lifestyler with a food plot or a sundowner with livestock to tend to do yourself a favor and check out New Holland's WORKMASTER family of compact tractors. Known for delivering outstanding value these reliable, powerful and easy-to-operate WORKMASTER compacts will help you completes tasks efficiently while being easy on your wallet. The latest member of the WORKMASTER compact family, the WORKMASTER 25S sub-compact, carries on the WORKMASTER tradition. 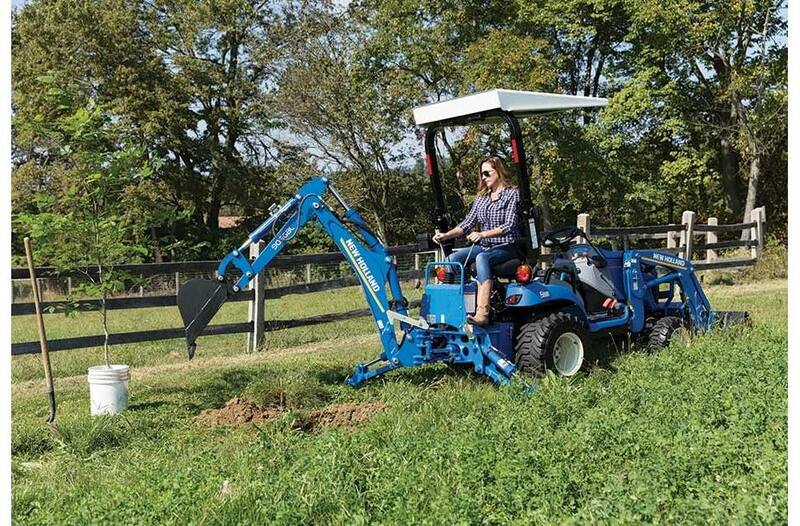 Small But Mighty: The WORKMASTER™ 25S sub-compact tractor is the perfect “first step" tractor for homeowners and AG-lifestylers who need a hard-working, versatile small tractor to handle the chores a garden tractor just can't. it's ready to take on your yard, landscape, gardening and property maintenance jobs. Its compact size makes it easy to operate and maneuver around obstacles and in confined spaces. 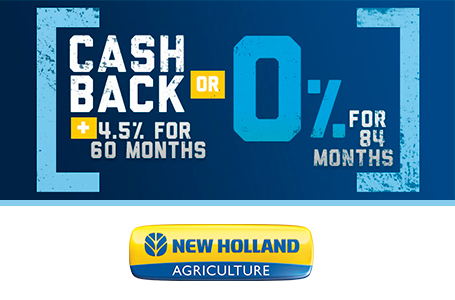 A Package That's Right For You: Choose tractor and implement package combination that's right for your needs. 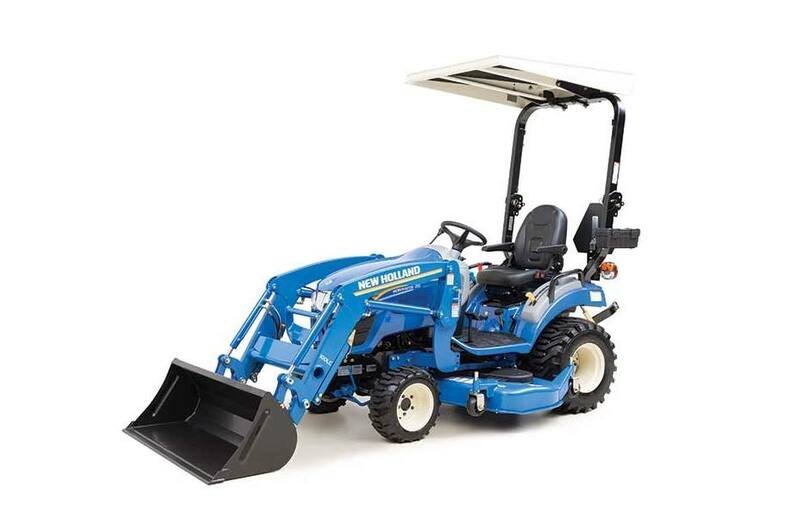 • Loader package • Loader backhoe package • Loader and mid-mount mower package • Mid-mount mower package The 100LC front loader turns you into a one-person moving crew, allowing you to load and move dirt, mulch, firewood, snow and more. The 905GBL backhoe adds digging, excavating and trenching to your capabilities. 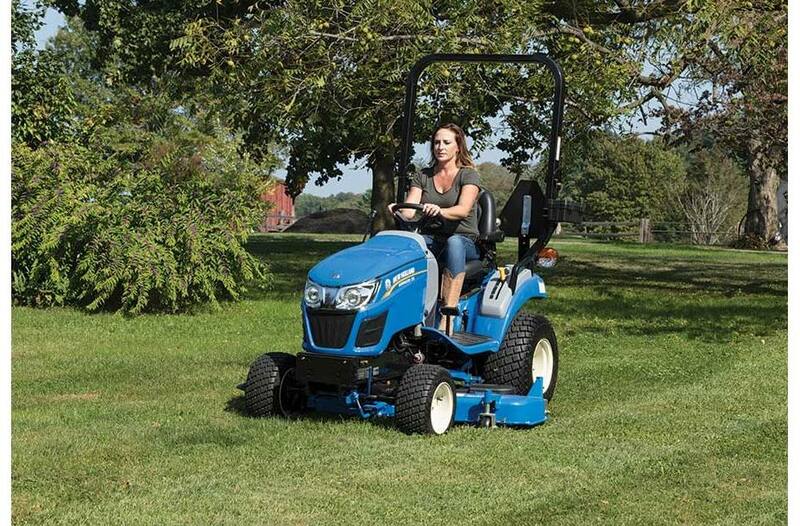 The mid-mount mower mows five-foot wide to cover large lawns in a hurry. 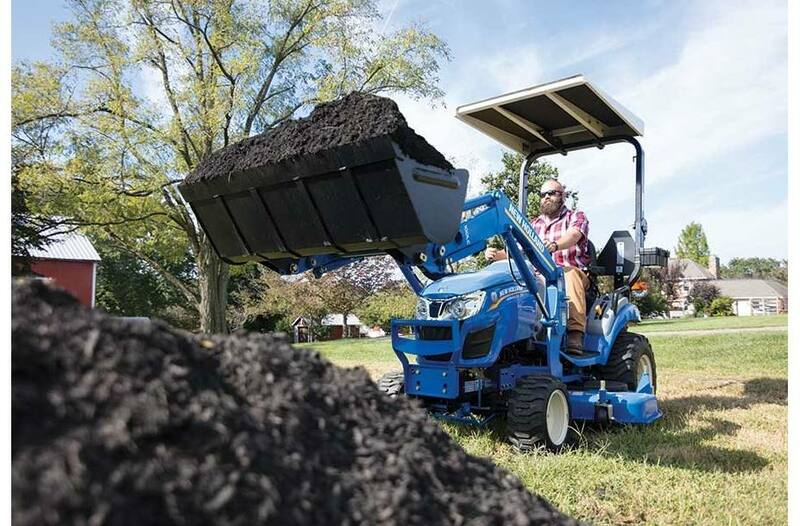 Power To Load, Mow, Dig and More: The WORKMASTER™ 25S sub-compact tractor packs a lot of power in a small package. With 25 engine HP on tap you will be amazed at what's possible. Bring on the your toughest chores. Rugged, Reliable, Fuel Efficient: The WORKMASTER 25S features a reliable 3 cylinder diesel engine. This naturally aspirated, 77.3 cu. in. (1.26L) displacement, power plant is fuel efficient and has the power Homeowners or AG-lifestylers need to make short work of their to-do-list. Easy Fill Up, Long Running Time: The WORKMASTER 25S features a large 6.6 Gallon (25L) fuel tank letting you complete more tasks between fill-ups. When it comes time to add diesel fuel you will appreciate WORKMASTER's large fill opening, which makes spills a thing of the past, and convenient, low lift, fender location. Infinite Speeds, Infinite Ease: The WORKMASTER™ 25S sub-compact tractor packs a lot of power in a small package. With 25 engine HP on tap you will be amazed at what's possible. Bring on the your toughest chores. Dual Pedals For Easy Operation: When it comes to changing speed or direction is doesn’t get any easier than with WORKMASTER. 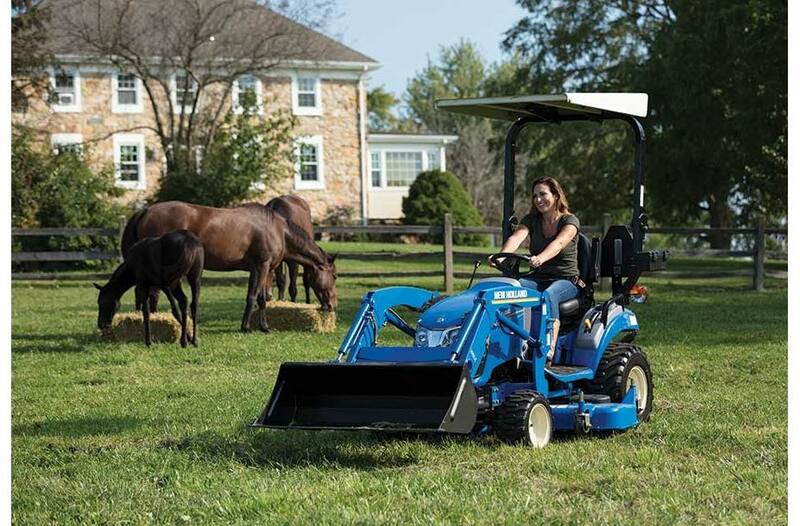 With its Dual pedal transmission design you'll master direction chances faster than you can say Loader work. The forward and reverse pedals feature anti-slip rubber pads that are color coded and embossed with their direction of travel for sure, safe operation every time. Cruise At The Touch of A Button: Lots to mow? Then you will appreciate the 25S' standard cruise control which will make the acres fly by. Simply use the forward travel pedal to achieve the speed you'd like to maintain then push the conveniently located cruise button - its that easy. Traction Enhancing Four-Wheel Drive (4WD): When it's slippery and wet there is not need to fret. The WORKMASTER 25S' standard 4WD will power you through the tough spots providing additional traction and pulling power. Rugged and Manuerverable: WORKMASTER'S heavy-duty 4WD axle is designed for the rigors of loader work. It's 5 bolt hub design and high load capacity is tailor matched to the performance of the 100LC loader. 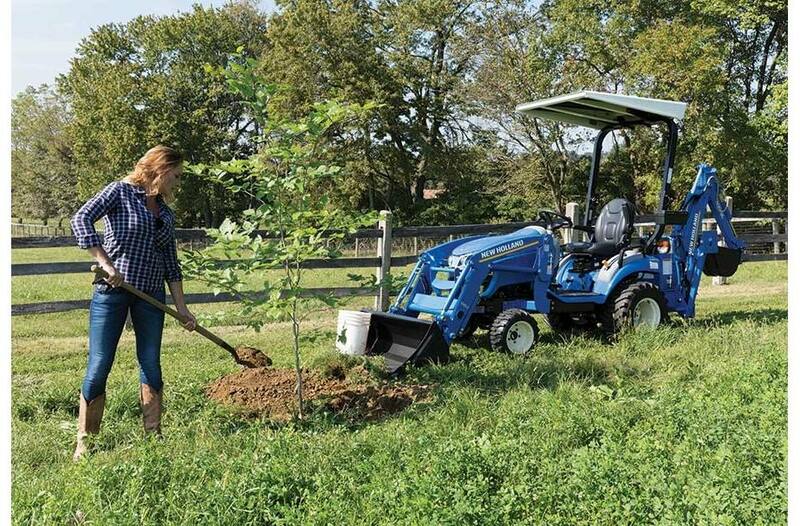 With standard power steering and its 4WD axle's tight turning design maneuvering the WORKMASTER 25S in tight spaces, even with a full bucket, is easy. Easy To Engage: When conditions call for more traction it is simple and easy to engage WORKMASTER's 4WD. Just push the 4WD engagement lever, located on the control pod, forward and go. Worry-Free Stopping Power: WORKMASTER'S brakes provide sure stopping and long life thanks to their wet disc design. The brake pedal, located on the left side, has an anti-skid rubber cover for sure footed application. To apply the units parking brake simply depress the brake pedal, lift up on the color coded parking brake lever and remove your foot from the brake. Independent Power Take Off (PTO): Every WORKMASTER™ 25S comes standard with 540 RPM rear PTO , to power 3-PT hitch mounted implements like a rotary tiller, and 2500 RPM mid-PTO power a 160GMS mid-mount mower or front mount attachment, like a 50RSHB snow blower. WORKMASTER'S PTO is fully Independent, which means you can engagement or disengage the PTO while stopped or on the move, and its multiplate wet disc design ensures years of trouble free operation. Simple To Use: With WORKMASTER using the PTO is quick, simple and, most importantly safe. The electro-hydraulically engaged PTO, like those found on big ag tractors, uses a push and turn, color coded knob located to the right of the units steering wheel. Rear, Mid or Both: You can choose the PTO you wish to send power to using the selection lever located on the left control pod. Choose Rear, Mid or Both depending on the attachment(s) you are using. High 3-Pt Capacity: With over 990 lbs. (450 kg) of 3-PT lift capacity you will be able to make the most of heavy implements like a rotary cutter, box blade or tiller. More Hydraulic Flow = Efficient Attachment Operation: WORKMASTER's robust hydraulic system provides 4.6 gpm (17.4 lpm) of dedicated flow for implement/attachment operation. That means you'll experience faster cycle times when operating a 100LC loader or 905GBL backhoe. A separate 2.1 gpm (8 lpm) steering pump ensures low effort maneuvering even with a full load in the 100LC's bucket. The 25S comes standard with an integrated mid-mount valve and ideally placed joystick control for productive, comfortable loader operation. Clear-Thru™ - Easy On and Off: WORKMASTER'S Clear-Thru™ operator's platform makes getting on and off quick and safe. Controls are placed out of the way so they don't impede platform entry/exit and because the platform is flat you won't be catching your foot on any transmission hump. 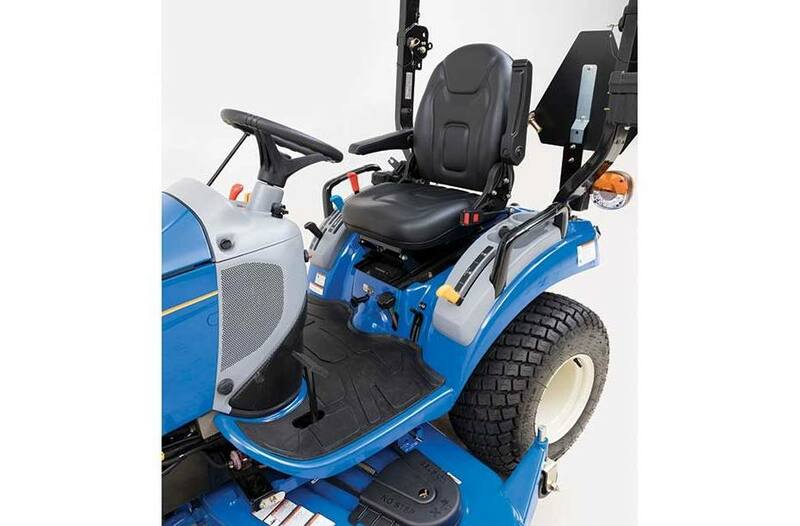 Once in WORKMASTER's seat you will be surprised and just how much room there is - impressive for a sub-compact tractor. Ideal Control Placement: If you have ever felt intimidated with the prospect of operating a tractor then the WORKMASTER 25S is for you. 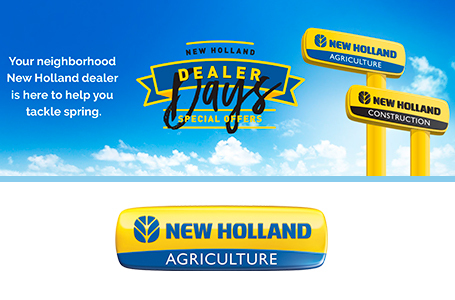 With the primary goal of safe, comfortable use New Holland's design team have managed to create an operator's area that will have novices running like pros. Deluxe pods, which contain transmission range, 4WD, PTO and 3-PT selection levers, flank the operate and fall intuitively to hand. Controls are color coded and label for sure handled engagement every time. Comfortable Operation Start with The Right Seat: Step onto the WORKMASTER 25S' operator's platform where deluxe, high back cushion seat awaits you. 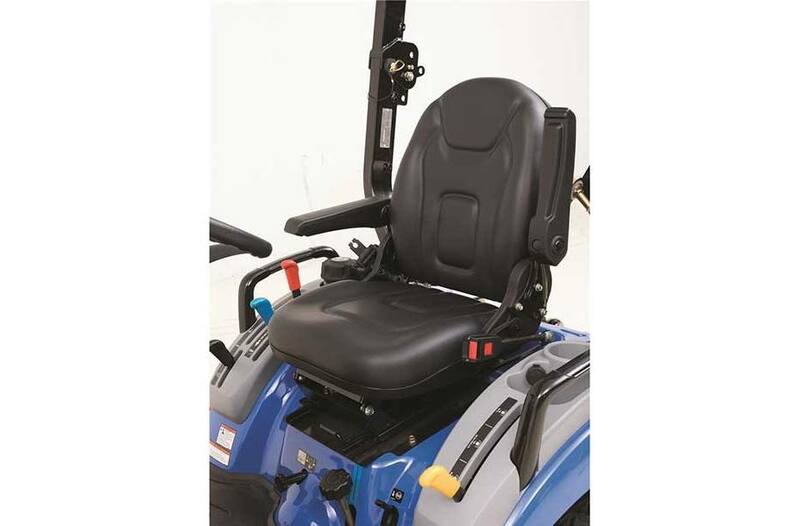 Featuring ample fore/aft adjustment on an incline track, an adjustable backrest and armrest WORKMASTER's seat is designed to accommodate a wide range or operators. Settle in, buckle you retractable seatbelt and get ready for a memorable operating experience. Instrumental Instrumentation: An instrumental part of safe, productive tractor operation is being informed. WORKMASTER has that covered with a modern, informative instrument cluster. The Little Touches Make The Difference: Sometimes it’s the little things that make the difference. Take the WORKMASTER 25S for intense. It comes with a power port to charge and a tray to store your cell phone, a large drink holder for your favorite beverage and a toolbox to store necessities. 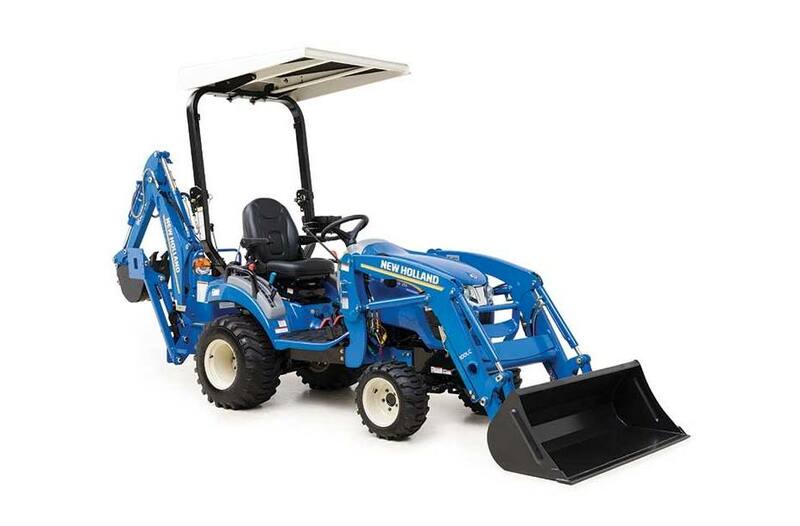 Performance Matched Loader: With its integrated mid-mount valve and ideally place joystick control the WORKMASTER 25S was designed with loader work in mind. Pair it with a 100LC Loader and get some serious work done. The 100LC's 1005 lbs. 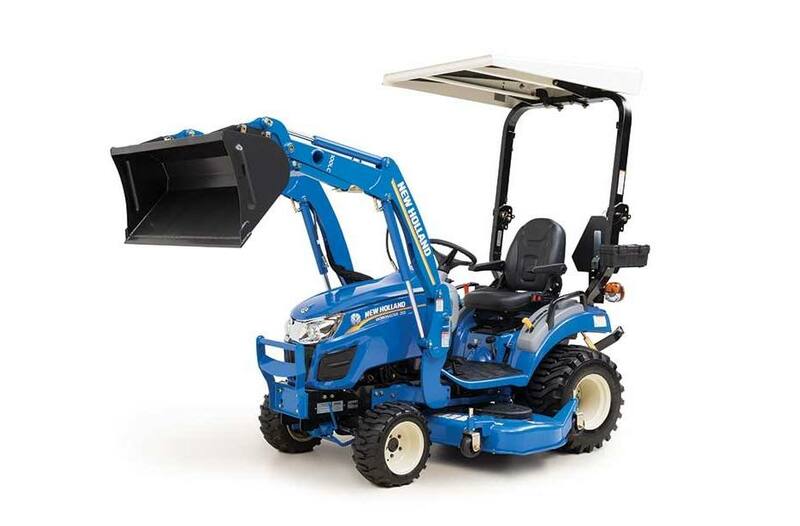 (456 kg) lift capacity allows you to take full advantage of its 50" buckets capacity, while its 72" (182mm) lift height allows you to reach placed others can't. Digging A Hole: WORKMASTER'S available 905GBL backhoe is one hole digging machine. Designed specifically for the 25S the 905GBL provide 79.4 inches (2017 mm) of max digging depth and almost 2200 lbs. of digging force. 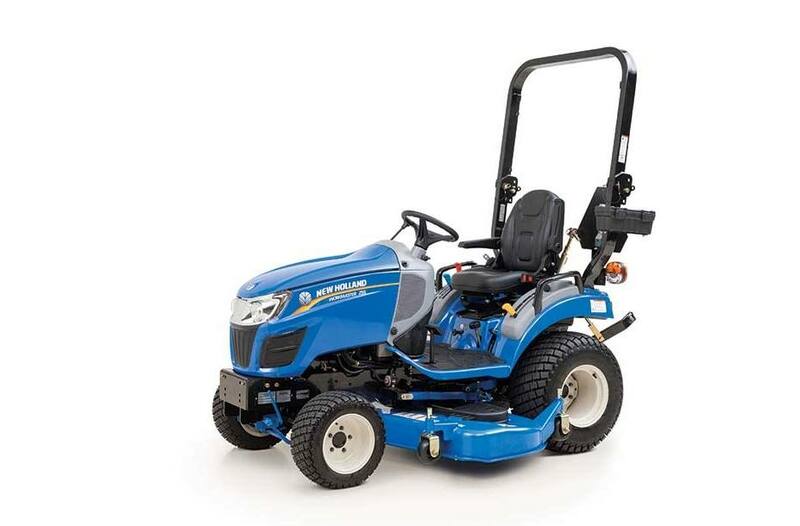 The Acres Will Fly By: WORKMASTER's available 160GMS mower provides 60 inches of estate mowing nirvana. Its rugged construction ensures years of dependable service while its 3 blade design provides excellent cut quality. Easy Servicing: WORKMASTER saves you time and money when it comes to maintenance, too. Convenient access to service points makes fueling up and performing routine maintenance quick and easy. Even when a loader or front snow blower is attached it’s easy to get under the hood of your WORKMASTER. Just open the hood, which smoothly raises on a gas cylinder, to access the engine, radiator, air cleaner on more. Fuel Up Faster: The WORKMASTER 25S features a large 6.6 Gallon (25L) fuel tank letting you complete more tasks between fill-ups. When it comes time to add diesel fuel you will appreciate WORKMASTER's large fill opening, which makes spills a thing of the past, and convenient, low lift, fender location. 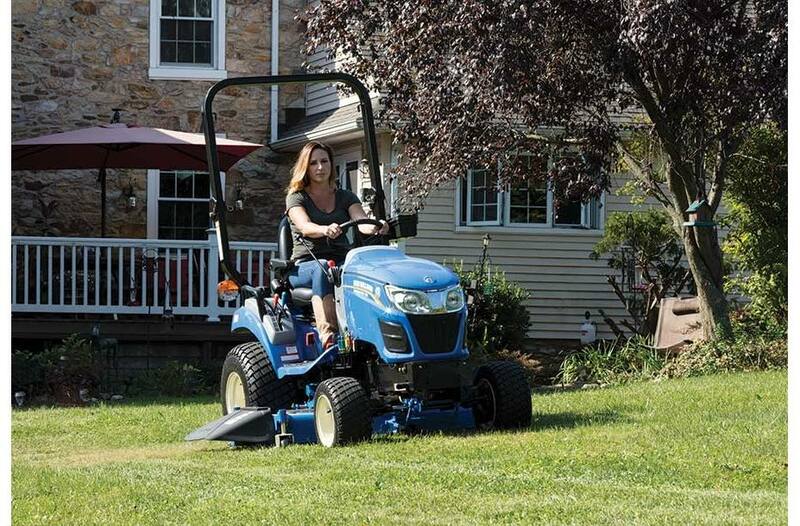 We Have You Covered: WORKMASTER™ compact tractors are covered by the FREE Boomer Guard6 Limited Warranty. It provides 6 years of worry-free operation, including 2 years of bumper-to-bumper coverage plus an extra 4 years of powertrain protection.